I've been opposing the endless stream of bills emanating from the Mayor and Honolulu City Council criminalizing homelessness for what seems like years. On reflection, it actually has been years. 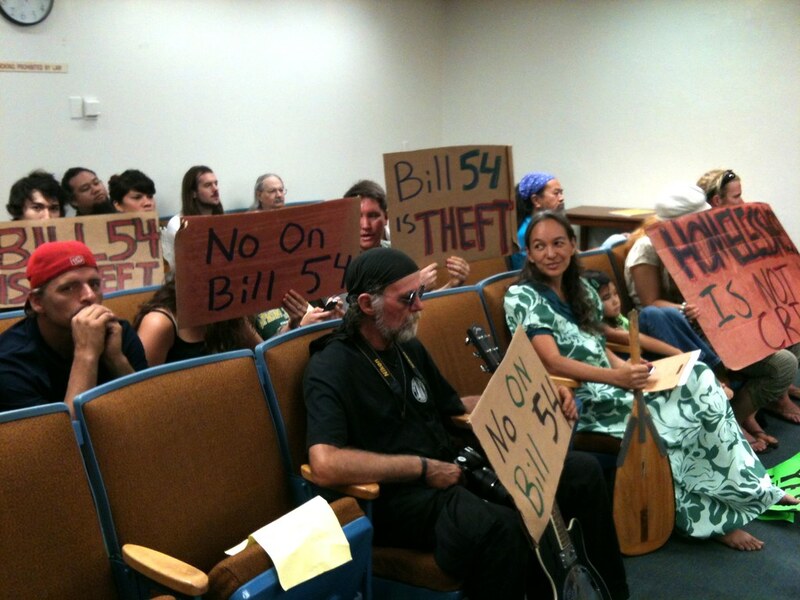 Introduced in 2011, Bill 54 met vigorous public opposition. But of course, it passed and became Revised Ordinance of Honolulu (ROH) 11-029. Although the Council claimed it was not targeting the homeless, that it was to keep people from storing property on sidewalks, its almost exclusive targets were the homeless. Them and Choon James who had signs critical of the Mayor and City on her property. The implementation of Bill 54 was thwarted when people learned to comply with the ordinance without leaving the sidewalk. deOccupy Honolulu used color coded tents to openly show compliance with the law. Many homeless learned how to show compliance with the law in the same way. Of course, Council went back to the drawing board and came back with Bill 7, which allowed no-knock midnight raids to seize property from those living in public. Also widely protested, Bill 7 became ROH 13-8. Implementation began in July of 2013 with paired raids on the homeless at 2am and again at 4am to make sure people who had set up after the 2am raiders left would be sure to be left with nothing — no tent, no bedding, no clothes, no food, no ID, no medication. Without looking it up, I get a little confused about several other bills introduced at around the same time as Bill 7. But I do remember Bill 59, which was introduced at the end of 2013. This bill so directly violated the Kanawai Mamalahoe (the Law of the Splintered Paddle) that the bill was ultimately indefinitely deferred in committee. But there is a truckload of new bills that are even more extreme now headed toward their third and final full Council meeting this Wednesday, 9/10/2014. Bill 42 one ups Bill 59 in its violation of King Kamehameha's very firmly worded law (enshrined in the State Constitution) by not only criminalizing lying on the sidewalk, but sitting down on it as well. These bills were drafted by Mayor Caldwell and transmitted to the Council where they have been heard twice in committee and twice by the full Council and will be heard for the final time this Wednesday, September 10, on the morning (9am) agenda. Here's a link to the Council's Agenda. There are links to the texts of Bills 42 and 43, and their variants, Bills 45 and 46.